The gold-painted frieze was owned by the Lederer family, wealthy Austrian Jews who were important patrons of Klimt’s. When the Nazis invaded Austria in 1938, the family escaped to Switzerland, but its extensive art collection was seized and its once formidable industrial empire bankrupted. Many of the family’s valuable works, including 18 Klimts, were destroyed in the final days of the war. The mammoth frieze survived and was formally returned to Erich Lederer, the family heir, after the war. But there was a hitch. The Austrian government would grant him export licenses for his other artworks only if he sold the “Beethoven Frieze” to the state at a cut-rate price, Mr. Lederer’s heirs say. Mr. Lederer finally agreed to sell the frieze to the government in 1973 for $750,000: half of its estimated worth at the time, according to an evaluation by Christie’s. Since 1986, it has been on view at the turn-of-the-century Secession gallery, where it was first shown at a 1902 exhibition named after Klimt’s breakthrough art movement. Cohen, Patricia. 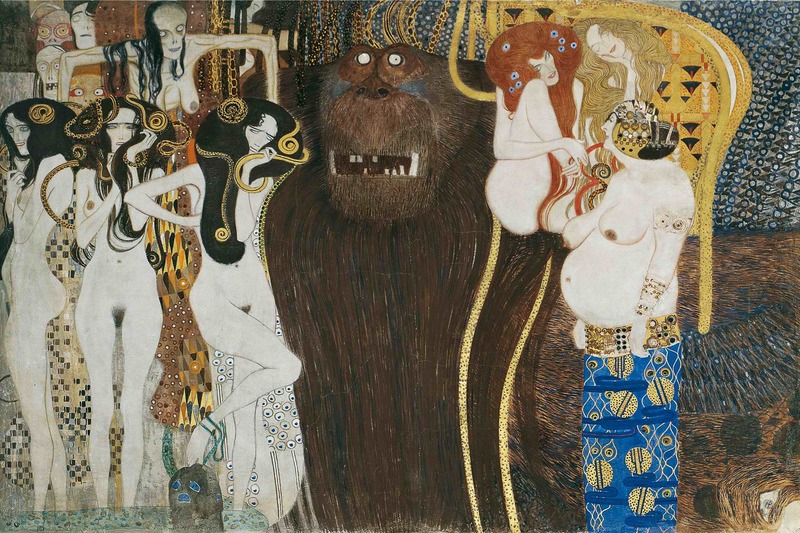 “Heirs Press Austria to Return Looted Klimt Frieze.” The New York Times, October 15, 2013.